AP Rc.No. 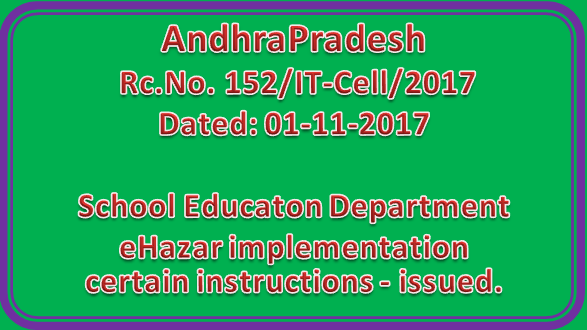 152 School Educaton Department-eHazar implementation -certain instructions - issued. Sub:- School Educaton Department-eHazar implementation -certain instructions - issued. 3. Directions of Hon’ble CM and Hon’ble MHRD & Chef Secretary in Review meetings. Video Conferences, etc. The kind attention of all the District Educational Officers in the state is invited to the reference read above regarding e-Hazar in School Education Department. The three aspects of the biometric attendance that need to be monitored in school education are attendance of Teachers, Students and Office staff. This is to be done though the e-Hazar Application provided by APOnline and NIC/IT & EC Dept.